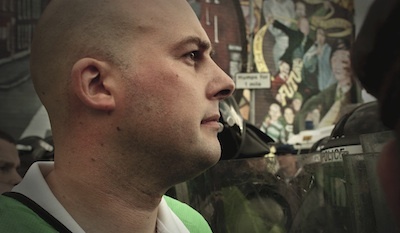 A republican activist who has campaigned against sectarian parades in north Belfast has been arrested and charged in connection with a speech he made at Easter. Dee Fennell, a spokesperson and chairperson of the Greater Ardoyne Residents Collective (GARC), described armed struggle against British occupation as “legitimate” when speaking to republicans at a gathering to commemorate the 1916 Easter Rising in Lurgan on Easter Sunday. In his speech, he said the right to use force to oppose foreign occupation was “a fundamental principle that cannot and will not be abandoned by activists involved in our struggle”. He also compared the British occupation in Ireland in 1916 to the plight of the Six Counties today. Unionists immediately demanded that Mr Fennell be arrested, and last Monday the PSNI carried out heavy-handed raids at homes in Lurgan and Ardoyne, taking computers and mobile phones and seizing the 33-year-old in front of his young children. He was taken for questioning to Antrim interrogation centre and was subsequently charged with ‘encouraging terrorism’. His arrest comes as his group is preparing for discussions surrounding the Protestant marching season and the attempts by the Orange Order to hold a sectarian parade through the nationalist Ardoyne and neighbouring areas of north Belfast. The march on July 12th, the anniversary of a Protestant victory in the 1690 Battle of the Boyne, has for many years been the most contentious of the marching season. Mr Fennell’s supporters fear he has now been subjected to effective internment -- indefinite detention without trial. His arrest follows comments by PSNI Chief George Hamilton last week in which he boasted of his force’s ‘success’ in locking up the leadership of republican groups opposed to the powersharing administration at Stormont. In his speech, Mr Fennell also accused the “unaccountable” PSNI and British military intelligence of deliberately seeking to target and intimidate republicans. He accused the British government of using miscarriage of justice victims Brendan McConville and John Paul Wootton -- still imprisoned over a Continuity IRA attack in 2009 -- as ‘political hostages’. Urging republicans to be more active, Mr Fennell quoted Sinn Fein deputy leader Maire Drumm, who was shot dead by loyalists in 1976. “It was Maire Drumm who stated: ‘It’s isn’t enough to shout up the IRA, the important thing is to join the IRA’,” he said. “When you leave here today, ask yourself is it enough to support republicanism or could you be a more active republican. Are you willing to assist a movement that will bring us freedom? On Tuesday, he was remanded without bail by a court in Craigavon. A crowd of men and women supporters, who had refused to stand as the judge entered the courtroom, erupted into applause and cheers as Fennell was taken out of the courtroom. Outside they unfurled a banner reading ‘End British Internment’. There were further protests in Belfast and in Dublin. The Irish Republican Prisoners’ Welfare Association, which organised the Easter commemoration, said it viewed the raids and arrest of Mr Fennell as a “blatant example of the continuance of British political policing in the Six Counties”. “Spurred on by Unionist and Loyalist hysteria and assisted by a pro-British media, the RUC/PSNI through its actions has attempted to silence a true and genuine Republican narrative by the use of force and intimidation. They will fail,” they said. The Republican Network for Unity denounced the decision to charge Fennell as an “abhorrent case of political policing” and a “blatant capitulation” to unionists. The 1916 Societies said it condemned the “draconian, politically-motivated arrest and detention of our friend and comrade”. Neither Sinn Fein nor the SDLP have commented on the development.